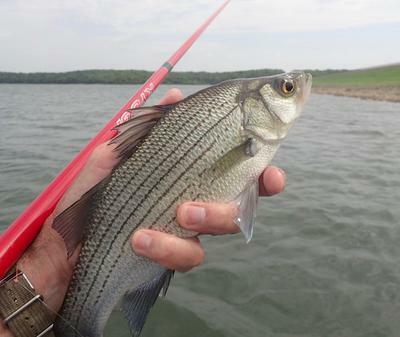 Over the last week and a half I made three trips to the dam face of Hillsdale Reservoir southwest of Kansas City. I've posted about this area before and it continues to be one of the most interesting and productive places in the area. The large earthen dam slopes gently into the water. The rock bottom provides cover and the shallow water lets in lots of sunshine, creating an incredibly productive ecosystem. The bigger fish come up from deep water and cruise the "flats". I've caught eight species of fish here, mostly in the 12-20 inch range. Carp are always around but not always biting, but when they do they will take a fly in the water column and do not have to be sight fished. Actual carp on the my carp rod was my goal. Alas, it didn't happen. The carp where in spawning mode and very active but not hungry. However, I averaged over twenty fish per trip and got to do a close comparison between the Kyogi 18 and several Kiyose rods that have been my "go to" at Hillsdale. The Kyogi is incredibly capable, obviously it's a carp rod, but still light and responsive enough to be fished all day and the big bluegill are still fun. A down side is it's four foot collapsed length. Unless you make a gear stash onshore you will only be fishing one rod. I fished the Kyogi on days one and three. Day one the White Bass were running and a White Killer Bugger seemed to work on everything. The fish were split evenly between Bluegill, White Bass and Freshwater Drum. Day two was Kiyose comparison day. I brought the 53M and 33SF. The shorter rod was an experiment to prove that close in fishing would work, even while standing in a large lake. The 53M was my big fish rod prior to the Kyogi and would provide a direct comparison. In addition, I bought a box of nightcrawlers and went keiryu for the day. I started with a Killer Bugger for a baseline and things were slow. I went to the worms and the action picked up nicely. The White Bass were not around, but some Channel Catfish showed up and provided real excitement. What did I learn? Fish like worms. The fish were indeed close and the shorter rod caught a lot of them. I love my 33SF and I've caught everything from micros to a Barracuda with it, but I ran up against it's limitations. On bigger fish it lacked the flex of a longer rod and couldn't always protect the tippet. I broke off several good fish that the 53M or Kyogi would have handled. I used an even mix of standard hooks and circle hooks with the worms. I caught 24 fish on worms with no gut hooks. The circle hooks usually ended up in the cheek like they are supposed to. A tight line is more important than the style of hook. I talked to Paul T., my Hillsdale guru, at the fly club meeting -- he had caught two carp the day before, plus lots of drum. I went back a third time loaded with the Kyogi for Carp. NO CARP. But seven catfish showed up. I fished Black Killer Bugger variations and caught 28 fish. The two most memorable fish were a big drum and a channel cat, both in the 16-18 inch range. I was using the Kyogi and I'm glad I had it. The cat pulled like a truck. I was in full big fish, power curve, rod flat on the water mode. The question remains, do you chose your rod for the fish you know you will catch or for that one you might. Worms will up your odds, but a Killer Bugger is never wrong. I'll check in at Hillsdale from time to time and I will catch a carp. In September the Walleye come up to spawn! Alan - What size Killer Bugger were you using? It was sure nice to hear about the Kyogi! One of the reasons I took my daughter on a walk at Lake Lowell was to scout for carp. All the thunderstorms this week have kept them off the flats. It is suppose to settle down this week. I agree with your assessment about worms! Interesting, our Walleyes spawn in the spring. Thanks for the great report. Not the Typical Tenkara Species! I'm liking these photos! Channel catfish and freshwater drum are incredible fun on tenkara rods--if you don't break the rod. (Message: Use the right tippet!) I'm sure the Kyogi works well on them. I'm working on a little article that includes a nice photo of a channel cat that I caught on the full-flex Tenryu Furaibo TF39, and, frankly, it was about all the fun I could stand. 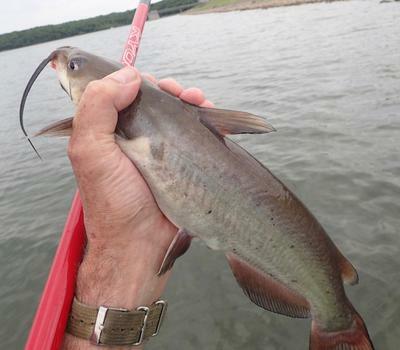 Catfish typically head straight for the bottom, and you can't just hoist them in with most tenkara-style rods. 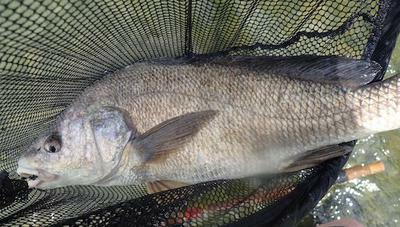 My wife has good luck on the freshwater drum. Anyway, I appreciate the article. I recently hooked a very large koi (I'm going to guess 20+ lbs) and found that the Kiyogi 21 with 12 lb fluorocarbon is so capable that the fish will literally straighten out a size 12 standard nymph hook (the fly was a UKB with a tan micro chenille worm tail) before the tippet or the rod fails! 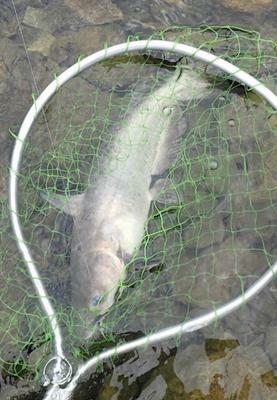 I had tried larger flies with heavier wire hooks, but the koi were ignoring them. I switched to the UKB/worm hybrid and immediately hooked up! I will now be tying some on much stronger hooks! Those are some beauties! Hopefully you get your carp soon. My most reliable spot was Willow Lake in the early morning, so check it out if you're in the neighborhood. I also bet that rod would be killer for wipers at Rocky Ford. Great report with my favorite rod (the Kyogi). Awesome for fishing anywhere that big fish are in the mix, for my local favorite spots I rarely deviate from the Kyogi. Has the power to give you a chance against some big fish and still fun with modest fish as well. Fall spawning Walleyes? Never heard of such a thing, that's really interesting. I was going to target trophy Walleyes with the fixed line on Pool 2 of the Mississippi during our April spawning season but April was pretty tough this year, though May is shaking out to be strange as well. I caught a big Walleye two feet from the bank at Hillsdale in September. Maybe it was only confused. I assumed spawn, but in fact the spawn is the spring. For the bigger fish at Hillsdale and for Carp in general I use the Gamakatsu SL 45 Bonefish hook in size 10. I also use some size 8. Paul T. is a carp specialist with a western rod, he uses 2X size 12 nymph hooks. A carp will straighten standard strength hook, he says from sad experience. I have carp hooks in stock. You can find them at the bottom of the Fixed Line Carp Fishing page. Back when I targeted Walleye (these days I only do once or twice a year), I caught large Walleyes tight to the bank pretty frequently. Mostly in Spring and Fall but even in Summer at times. Especially in river systems or in the morning/evening. If the food is there the fish will be as well. My friend Luke sent me some hooks from England. The size 6 that Chris carries are about the biggest hooks they use over in England for Carp. I am sure the Owner hooks from TenkaraBum will work great. They look similar to some of the ones I got from England. The hooks I got from England are wickedly sharp! Most of them came individually packed with a little rubber nib to protect the tip! The number 7 longs I tied into Keeper Kebari, and is the only fly I have landed carp on so far. Maybe because it is the one I fish 90% of the time. I fish corn on a size 14. My buddy Luke goes down to a size 18 if he has to. Carp are underrated. They are one of the smarter fish out there. I wish the thunderstorms would go away so they would come up on the flats! The water temperature is perfect where I like to fish, and there is a lot of water in the trees. The carp are too smart to come into the trees because of lightning. Hopefully next week!